﻿ BMWBMW • View topic - What have you done to your BMW today? What have you done to your BMW today? Got a Tech Question? Know something about BMWs? Re: What have you done to your BMW today? JimVonBaden wrote: Helped a friend change his clutch, slave, clutch hose and clean/adjust his pivot bearings on his 04 R1150GS. Not bad, took 7 hours. His clutch disc was fried, and the pressure plate was definitely overheated at some point. I'm curious how many miles that clutch had on it? Something like 50K miles. It was very obviously abused at some point. 50K? Is that a normal thing for 50K? Well seeing it was a balming 30 degree yesterday I gave Gertrude a bath. Oh and ordered two tires, the rear is ready to be changed and the front is close too. So 3 hours of TLC later and Gertrude is wearing a new pair of tires. Decided to put the Michelin Road 5 Trails since I have had such good luck with the Michelin Pilot 4s. It was funny yesterday as I was coming out of the garage I could hear the squeaking from then-new rubber. 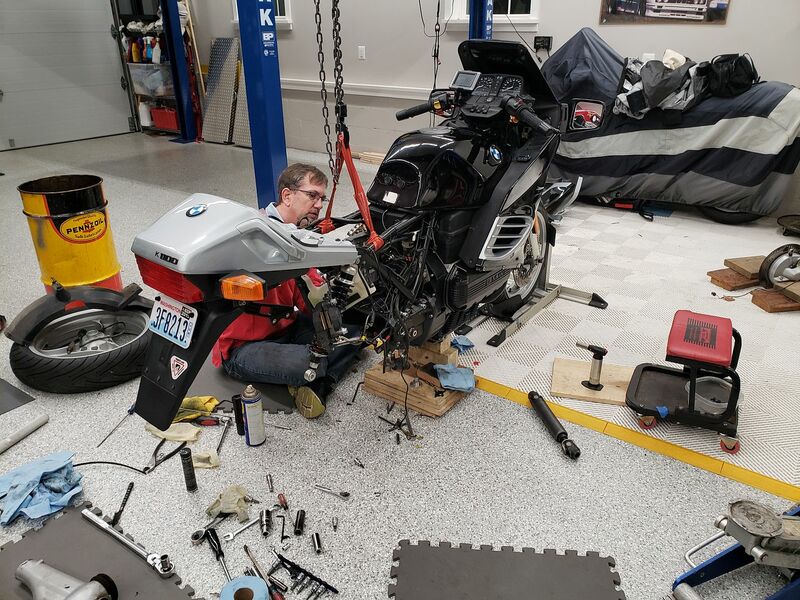 "dumped my entire tool box on the floor under a BMW"
Installed my new carbon beak. That was an expensive piece of carbon! JimVonBaden wrote: No, it was abused. JimVonBaden wrote: I'm curious how many miles that clutch had on it? I had my clutch replaced at 126,000 miles. I think that is long for a dry clutch. I use the friction zone all the time in traffic but I keep the revs low. I also try not to jump off the line from a stop.